Nine of the 10 warmest years have occurred since 2005, with the last five years comprising the five hottest, according to NOAA. This, according to scientists, is a result of the continuing warming trend caused by the excess emission of greenhouse gasses into the atmosphere. NASA shares this knowledge with the global community and works with institutions in the United States and around the world that contribute to understanding and protecting our home planet. 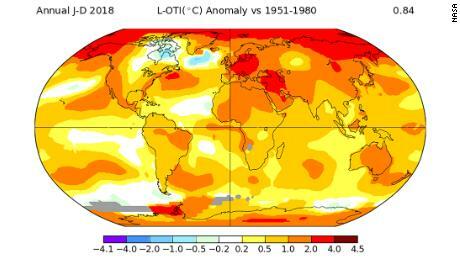 The latest figures mean 2018 ranks as the fourth-hottest year since modern record-keeping began in 1880. "2018 is yet again an extremely warm year on top of a long-term global warming trend", Gavin Schmidt, director of GISS, said in a statement. Record warmth was seen over much of Europe for 2018, which saw summer temperatures well over 90 degrees Fahrenheit - over 32 degrees Celsius - all the way up to the Arctic Circle. Record-breaking: The NASA study found that Earth's global surface temperature a year ago was 0.83 °C warmer than the 1951-1980 mean. This year has started with mild El Nino conditions, "which suggests 2019 will be warmer than 2018 but that's more a rule of thumb than a firm prediction", Schmidt said. "Weather dynamics often affect regional temperatures, so not every region on Earth experienced similar amounts of warming", said NOAA. Though there are minor variations from year to year, all five temperature records show peaks and valleys in sync with each other. The WMO said sharp temperatures also contributed to a number of extreme weather events such as hurricanes, droughts and flash flooding over various regions of the world. "There was no Greenland and sea level was about 25 meters higher". The higher average temperature and record concentrations of Carbon dioxide in the earth's atmosphere have massive consequences. Trump has vowed to pull out of the 2015 Paris agreement forged by almost 200 countries, including the U.S. The pact sets a goal of keeping global warming "well below" 3.6 degrees Fahrenheit over pre-industrial levels, a threshold meant to avert the most devastating and irreversible effects of climate change. It appears highly likely, at least from today's perspective, that that line will be crossed, despite the fact that more than 190 countries have signed the Paris climate agreement, which sets targets for reducing greenhouse gas emissions. The records also show that the annual temperature of the Old Continent increased at an average rate of 0.12 Celsius degrees per decade since 1910, although it has nearly quadrupled to 0.43 Celsius since 1981.